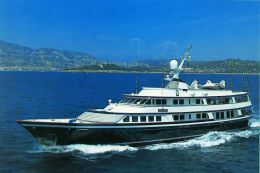 In the useful phone numbers book aboard the most prestigious superyachts cruising in Italian waters and, more generally, along the coasts of the central-eastern Mediterranean, there's a name which we like to imagine circled in red: Luise Associates. The reason is simple: keying that number means the satisfaction of any request linked directly or indirectly to a vessel, its passengers and its crew. Need a helicopter for a spontaneous trip? The owner's dog can't do without a real English lawn for his hygienic stroll on the spacious bridge aft? A Thai-Ukrainian simultaneous interpreter is needed to put an unexpected guest at ease? No problem. The female voice that answers is always courteous, calm and confident, well used to mobilising - at any hour of the day or night - the vast organisational machine which since 1847 has been serving the powerful of the earth who cruise our waters. That was the year when Joseph Luise implemented an idea that had run through his mind every time he saw, from the Naples shore, the merry swarm of people of all kinds who - with various qualifications but more often without any - offered their services to the yachts anchored in the bay. Since then, almost without interruption except in wartime, the activity has developed through the generations to become what today is proudly presented as an old family tradition. So it is no surprise that it is a Luise who grants us an interview aimed at learning more about a company that has made a firm lifestyle of discretion and confidentiality. Forty-one years old, specialised in the operational sector and in marketing, Francesco Luise works in close contact with his two brothers, two cousins and his uncle. The family aspect and tradition of your company present a reassuring image. But we imagine that you aren't all close relations. Of course not. Also because our business is actually a group of 23 companies - some controlled and some in which we have shares - that operate in a capillary manner along the entire coast from Montenegro to Sanremo. Our total personnel numbers around 60, distributed among the four main offices of Naples-Capri, Porto Cervo, Rome and Venice. What exactly does your activity consist of? 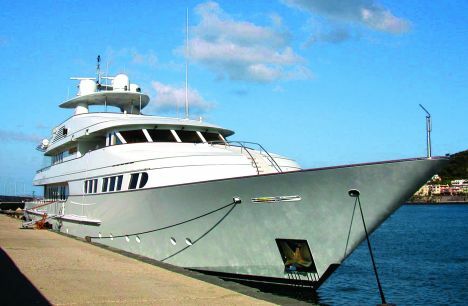 We assist pleasure craft in resolving all kinds of problems: from a child with a temperature to engine breakdown, from booking a restaurant table to organising the crew which, for the record, can easily be seventy or eighty people on a 140 metre yacht. But there's more to it. Since there is an increasing movement towards treating these yachts as commercial vessels - now obligatory for charter activities - with our traditional function as shipping agents we have become the interface between shipowner and shipping authority. The rules, which eliminate many ambiguities, are actually recent but - it'll seem strange to you - we had been ready to assimilate and apply them for decades. For example take compliance with the safety regulations: in the eyes of the non-professional they are like a maze of obligations and provisions in which it seems nigh impossible to get your bearings. But on the other hand of you want to enjoy the considerable economic advantages available to commercial vessels - such as cheaper fuel - the problem has to be faced. This is really an embarrassing question. Modesty apart, we may say that in the pleasure craft field we are the absolute European leader. It should be understood that we had no intention of exercising a sort of monopoly in the Mediterranean but that is the actual situation. A good comparison would be with the Americans. They're very good on the hardware side. But for across the board assistance we're better, maybe precisely due to almost two centuries of experience. We could say the same about France where there are companies very good at specific things but which cannot cover, as we do, all possible exigencies. However, the direct relationship with the territory must have some importance. Fundamental I'd say. This is precisely why it isn't at all our policy to be omnipresent as Luise Associates. On the contrary, we are based on local subagents, experts of the territory whom we carefully select and suitably train with view to guaranteeing our customers the same high qualitative standard of service everywhere. So at least in theory you could expand in this way without limits. Is this your intention? No, this isn't in our programmes. We shall certainly be opening other companies of a strong local character, it being unthinkable not to have a strong presence in places like the French Riviera and Palma de Majorca. But for the moment we want to stay in the Mediterranean. This is why Naples remains the fulcrum of the whole activity. Certainly this zone is every bit as unique - if not more so - than the places I've just named. But the problems are different and far more complex. Take the case of moorings, a really painful point. Exploiting our special experience on this subject - remember that we managed the port of Capri and later part of the port of Ischia - we're pushing for the recovery and development of the jetty we've had under licence for thirty years and which in fact bears our name. Apart from this we've got plenty other projects, many of them still being drawn up. Another of our characteristics, you see, is that we're very much to the point, without disdaining - indeed advocating - the intervention of public companies. Our dream is to see this bay - the potentials are all there - becoming a port of call for all large pleasure craft. This would enormously benefit not only the city but the whole region and, by reflection, the image of the entire country.